Preheat BBQ to high. Meanwhile, clean and trim asparagus. Place in a shallow dish and drizzle with olive oil and sprinkle liberally with salt.Toss to coat well. When BBQ has up to temperature, reduce heat to medium and place asparagus right on the grill or in a grill basket. 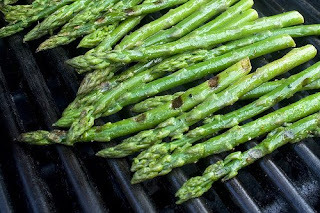 Grill with the lid down for about 10 minutes, turning regularly, or until asparagus is slightly charred but still tender crisp. While asparagus is grilling, make the pesto. In a food processor bowl, combine basil leaves, garlic, toasted pine nuts, parmessan cheese, 1 tsp red wine vinegar and about 1/2 cup of olive oil. Process until fairly fine. Add more olive oil, as needed until a paste forms; it should be more wet than dry. Taste and adjust seasonings, adding salt and up to 1 tsp more of red wine vinegar. Transfer to a jar. This recipe will make a lot. To store pesto, cover the paste with olive oil to prevent air from reaching the pesto. Refrigerate. Great as a flavouring for scrambled eggs, brushed on fish after cooking, or even in a salad dressing. To serve grilled asparagus, toss with 1-2 tbsp of fresh pesto. Top with a few shavings of fresh parmessan cheese (from a block, not a carboard container!). Serve warm or at room temperature. Last nights trip to the Calgary Jazz Festival took me to the Gateway Lounge at the SAIT campus where we saw the John Abercrombie Organ Trio featuring Abercrombie on guitar, Gary Versace (B3 organ) and the amazing Adam Nussbaum (drums). The group performed Abercrombie's original compositions and was an impressive performance, probably the best of all the concerts I've seen so far this week. We were sitting near the back of the room and I was very much taken back by the group's dynamic variations which ranged from a whisper to a roar. Alot of this was due to the due diligence of master drummer Adam Nussbaum who's loose and Elvin Jones inspired feel propelled the group through one longer set with the utmost discretion and musicality. 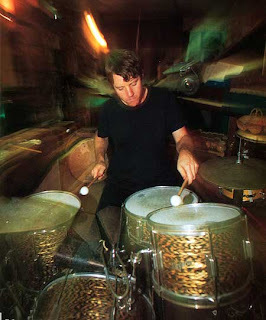 Adam has always been a favorite drummer of mine and I was really impressed by his loose feel and energetic approach. It was cool to see him in action and I really dug his loose movement which noticeably translated into such a full, loose and flowing sound on the drums. Something I plan to work on for sure ! Here's an older video of Adam Nussbaum playing with the Abercrombie trio featuring Dan Wall on organ. Adam is also a master of the brushes and he demonstrated this several times last night on a couple of ballads and a straight-eighth, latin type of piece. 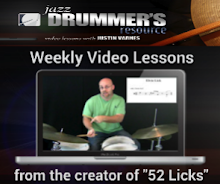 He recently co-authored an excellent instructional DVD with Steve Smith that deals with the brushes. 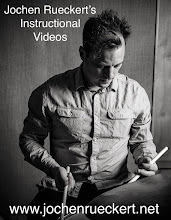 Here is a brief clip of Nussbaum showing how the brushes are meant to be played ! I played a fun set with the Brenan Brothers on Friday night at the Beatniq. I stayed afterwards and saw a GREAT band of young musicians from Vancouver lead by the talented pianist Amanda Tosoff. They performed mostly original tunes that were masterfully crafted and full of creative ideas and good melodies (something lacking in today's original jazz music, but that's for another post !). I also really dug the obvious Duke Ellington influence in both her playing and writing. Inspiring to see that young musicians are checking out Duke ! Morgan Childs was playing drums and sounded fantastic. I could relate to his style and obvious influences and I look forward to hearing more of this great drummer in the future. I think he has a CD of his own out there, so I will have to try and pick that up. Swingin' ! Okay, I have to hit the road here but before I leave, I also caught NYC drummer Jerome Jennings with Steve Hudson's Outer Bridges Ensemble and Tyler Hornby sitting in at Calgary's Auburn Saloon earlier this week and they all sounded great. Last evening I had the opportunity to see one of my jazz drumming heroes, Jimmy Cobb and his "Kind of Blue" tribute band at the Calgary Jazz Festival. The group featured an A-list of performers including the legendary Jimmy Cobb on drums, Wallace Roney (trpt), Vincent Herring (alto), Javon Jackson (tenor), John Webber (bass) and Larry Willis (piano). The group performed all the material from the seminal Miles Davis album "Kind of Blue" (which is currently celebrating its 50th anniversary). The band played great and captured the essence the Miles Davis sextet without having to resort to soley recreating the music from the album note for note. In particular, Vincent Herring on alto saxophone really stood out as did bassist John Webber who, apparently, was a last minute sub for an ill Buster Williams! Jimmy Cobb swung hard, as usual, and demonstrated a sense of swing and taste that has become his trademark during his past 80 years. Specifically I was impressed with Cobb's pointed quarter note feel on his left ride cymbal and the occasional crossstick on beat 4, which of course has defined his classic feel. His hook up with the pianist was also a lesson in comping and a text book example of how a drummer and piano player can work together in backing up a soloist. I was quite lucky as I was sitting in the 2nd row right in front of the drums. As close to a drum lesson with Mr. Cobb as I'll ever get ! Here's some rare footage of Cobb propelling the Miles Davis sextet on the classic tune "So What". Wes Montgomery "Smokin' at the Half Note"
Actually, there are just way too many great Jimmy Cobb albums to mention here (!) but those are a few that immediately come to mind. And of course there are all the great albums he recorded with Miles Davis. "Live at Newport" and "Live at the Blackhawk" are a couple that particularly stand out. Here's a recording of the blues "Pfrancing" from the album "Someday My Prince Will Come". Dig the way that rhythm section of Cobb, Wynton Kelly (piano) and Paul Chambers (bass) really make this one cook. Fortunately, Jimmy Cobb has been around a long time but its only been in the last few years that has he stepped out as a leader. I don't believe he recorded an album under his own name until the 1990s ! 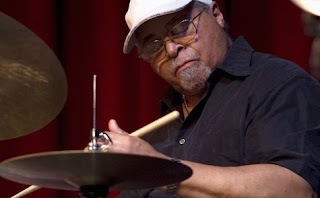 Here's a couple of more recent clips of Jimmy Cobb swingin' hard. Thanks to an understanding volunteer at the Calgary Jazz Festival, I was able to sneak backstage after the performance and get Jimmy Cobb to sign one of my ride cymbals. Me: Mr. Cobb, I'd be honored if you'd sign my cymbal. JC: Hey that's not a bad idea. I should have asked Papa Jo Jones to do that when I used to follow him around ! Hmmm....this is a nice cymbal. Are you sure you want me to get it all dirty with this pen ? JC: Oh okay. Just don't sell it on ebay. Thank you for a lifetime of great music ! Last night I had the opportunity to hear the critically acclaimed electro-acoustic groovy jazz trio Medeski, Martin and Wood at the Calgary Jazz Festival. It was the first time I've seen this trio perform live although I have seen the drummer perform solo concerts in the past. When I stepped into the concert hall I was shocked at the size of John Medeski's setup which included a grand piano hidden among an assortment of keyboards and a B3 organ. Maybe his set-up just seemed large in comparison to drummer Billy Martin's minimalist four-piece drumset and small table of assorted gongs, shakers and metal objects. The audience sure got it's money's worth as the band played two long sets which each exceded over an hour. The music they performed consisted of extended groove based pieces with much emphasis on atonal soundscapes. While far from being just a "jam band" the group explored a variety of grooves ranging from slick funk, afro-cuban to all out free jazz. I was really impressed by not only the group's deep grooves but their ability to exploit and explore all the sonic possibilities of their instruments. And for John Medeski there was lots to explore ! I especially appreciated his use of a melodica which, as far as I could tell, was pumped through some sort of distortion or effects patch (!) Nice. In particular I was quite impressed with the drummer Billy Martin. Martin is a great drummer obviously influenced by the great funk drummers such as Bernard Purdie, Clyde Stubblefield and Zigaboo Modeliste. He has a great feel and gets a nice pocket with a light touch. 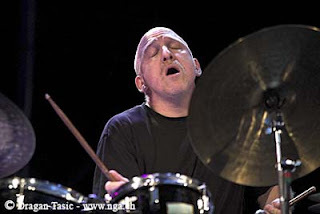 However, what really knocked me out was Martin's obvious deep connection to Afro-Cuban, Brazilian, West African and Indonesian Gamelan rhythms and how he seamlessly integrates these patterns into his playing. His sense of texture and sound is also quite impressive and he has uncanny ability to orchestrate the music around him perhaps more so like a "percussionist" than a traditional groove-based drum set player. He's very creative and you never quite know what he's going to do next. 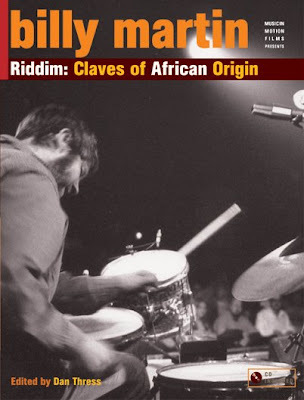 For those interested in Martin's approach to coordination and stylistic approaches, check out his fine book "Riddim". The coordination required for these patterns isn't easy and there is alot of information to be found in this book. The way he wrote out his patterns, using his own notation, is also quite inventive and worth checking out. I'm pretty sure that this book will eventually go down as one of the great drum set instructional books along with Stick Control, The Art of Bop Drumming, etc. 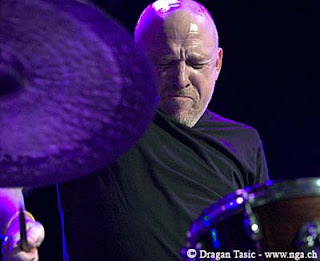 So, if you have a chance to check out Billy Martin or Medeski, Martin and Wood....do it ! 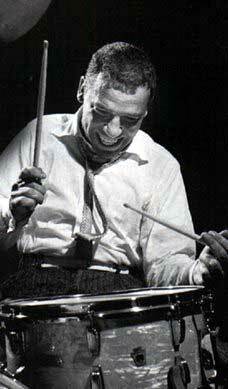 Joe Harris is a great jazz drummer who was well known back during the 1940s and 50s during the Bebop era. He played with the seminal Dizzy Gillespie Big Band and all the other Bop heavyweights of the time. I haven't heard much of him, but always enjoyed what I did. I think he might have switched careers at some point (?) However, Joe is still alive and I recently found this clip of him swingin' like mad...at 82 years young ! Let's hope that we all live that long AND sound that good when we reach there ! Here's a clip of Joe Harris from 1947 with the Dizzy Gillespie Big Band playing "Salt Peanuts". And here's a recent video of Joe laying it down. Jon Wikan is a GREAT drummer from New York (orginally from Alaska, I think ?). I used to see him play in Montreal from time to time as he's married to Canadian/New York trumpeter Ingrid Jensen, who's sister is the Montreal-based saxophonist and composer Christine Jensen. 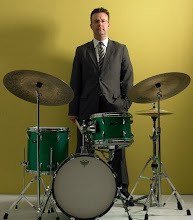 Jon also plays drums and cajon in Darcy James Argues' big band "Secret Society" and the group "Nordic Connect". Jon has posted some nice clips of him demonstrating some basic time keeping techniques on YouTube. He's also into food and has provided a great step-by-step demonstration of his favorite Pad Thai recipe which I intend on trying this week. 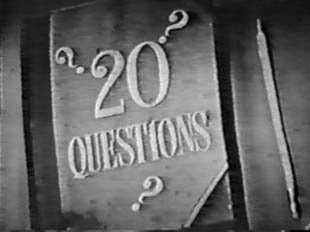 Thanks again to all who replied to my questionnaire. 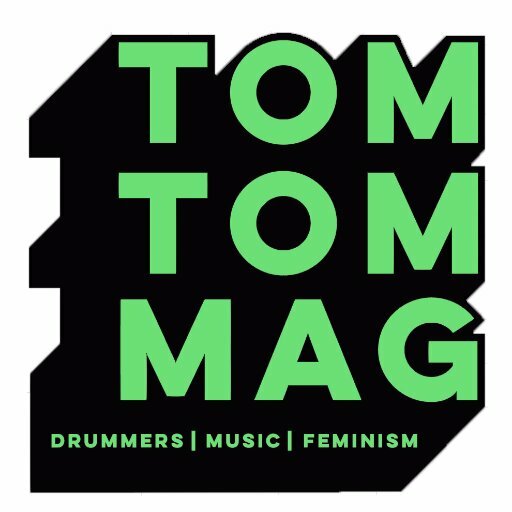 Here's my answers and recent contributions by one of my favorite drummer's from Toronto, Ted Warren and Montreal's B3 Hammond diva, Vanessa Rodrigues. "The Straight Horn of Steve Lacy"
Danny Boy (Irish trad.) - also, almost any traditional Irish song. They're masters of melody !!! If it's Magic - Stevie Wonder, from "Songs in the Key of Life"
Also, the horn interlude from Sir Duke - also on "Songs in the Key of Life"
Y Hubo Alguien - from Marc Anthony's "Contra la Corriente"
Here are some of the first responses to the questionnaire that I sent out. There are lots of interesting bits of info here. Miles Davis: Live in Tokyo 1964. I enjoy this record more year after year. Sam Rivers and Tony Williams are telepathic! "Touched by Sound"- John Wyre. Lawrence Welk. I'm not kidding. I still watch him every chance I get. Great melodies, perfectly matched vibratos, bizarre sets, entertaining in every way. I feel kinda the same way about Liberace. Something that has wide leaps but is still singable, as in Kenny Wheeler's music. Unpredictability, in chord stucture, is and interesting quality. Wayne Shorter is a good compositional example. I like the flow of the music of Robin Eubanks, Dave Binney, and Dave Holland to name a few. Nice grooves, rarely in 4, but the odd meter doesn't attract attention to itself. Ron Miller's "Modal Jazz Composition And Harmony"
I recently sent out a questionnaire to many of my friends, associates and teachers. 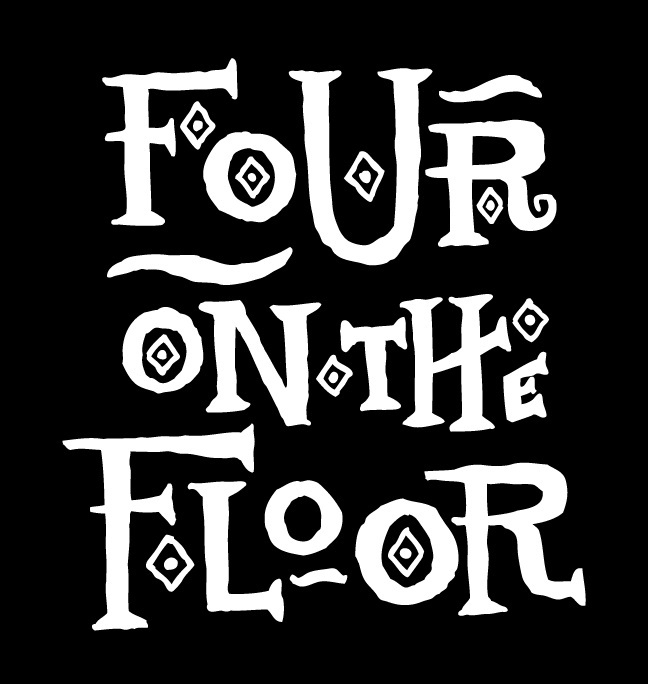 This was inspired by a similar set of questions that Ethan Iverson (pianist with the Bad Plus) sent out to various jazz musicians and then posted the answers on his own blog at Do The Math. I was impressed by some of the intriguing answers that different musicians provided. I also noticed that other jazz musician/blogger types were also coming up with there own version of this questionnaire on their own blogs. So here are the questions I e.mailed to everyone and I promise to post the answers as I compile them. Sorry - I've had to curtail my blogging recently. Been very busy lately having moved back to Calgary and trying to get settled in. But it's great to be here ! Hmmm.....snow in June ? What's that all about ??? 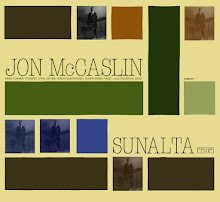 Anyways, I just came across these three clips of myself playing with the Mark Wilson Septet from the spring of 2007. We played a weekend at the Beatniq (Calgary's premier jazz club) featuring the music of the Wynton Marsalis Septet. 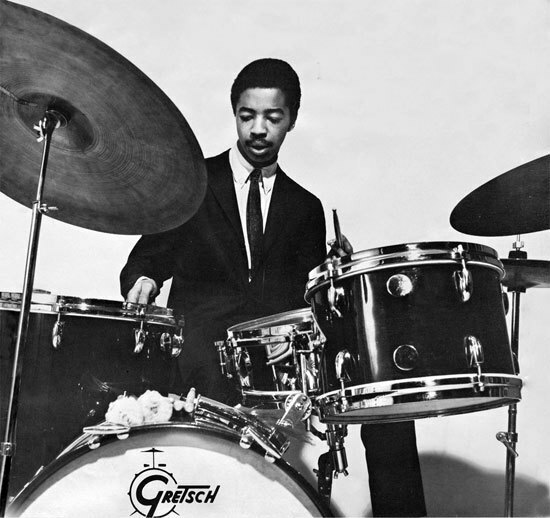 An interview with the late, great Tony Williams. He talks about his early days with Jackie McLean and Miles Davis among other things. Apparently McLean had to ask Tony's mother for permission for him to join his band and move to New York from Boston. So, in a way, even Tony payed his dues playing shows !